There's music in the air all summer long in Scottville. 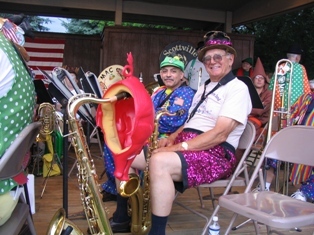 The Scottville Clown Band Shell concert series is held every Tuesday night throughout the summer, from early June to late August. The Scottville Optimist popcorn wagon will also be featured at the concerts. So bring a chair and kick back while you enjoy music presented by a variety of talented performers. The Tuesday concert series features a variety of artist performers. Concerts start at 7pm. 5 - Mason County Central Jazz Band and MC Jazz. 12 - Kevin Kimes & Andy Thomas. 19 - Fremont John Ashton. 26 - Edgar Struble & Friends. 3 - Scottville Clown Band Patriotic Concert. 10 - RPM, classic rock including Dale Horowski. 17 - Mason County Civic Band. 24 - Redux, featuring Lexi Alvesteffer and Dave Kosla. 31 - Jim Dodson, acoustic guitar from Mason County’s east side. 7 - Chad Rushing, guitar and blues. 14 - Cats N Jammers, oldies from Fountain. 21 - Scottville Clown Band Homecoming Concert. Events are listed according to the information available at the time of the most recent update to this story. Schedule is subject to change. For more information, contact Scottville Band Shell Committee Co-Chairman, Rob Alway at (231) 757-3202. All about the Scottville Clown Band -- "The Big Noise from Scottville"